Hemmed in by the sea on one side, the town of Lowestoft sprawls relentlessly in the other three directions, like a liquid flowing downhill. The quality of the urban landscape is not, quite frankly, very high. In Pevsner's The Buildings of England: Suffolk, 22 pages are given to Bury St Edmunds and 20 to Ipswich; but Lowestoft receives just six, and most of this taken up by St Margaret, the medieval Borough parish church. But Oulton is a pleasant enough space, protected from the industrial horrors of central Lowestoft by the charming Normanston Park, and from 19th century Oulton Broad by the open lake of the same name. There was considerable building here in that century, and the parish was home to the Lowestoft area workhouse; the workhouse chapel survives. 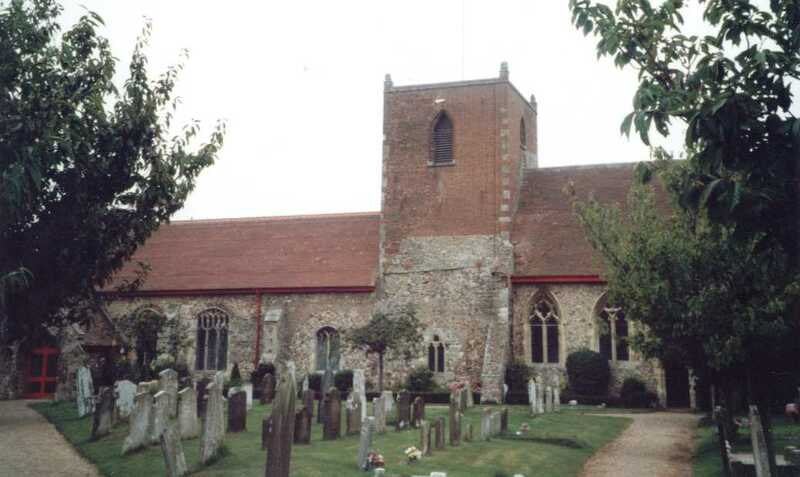 And right on the edge of the suburb, right on the edge of Lowestoft, so that the wide marshes stretch beyond it into Norfolk, is St Michael, Oulton, one of the modern Borough's six medieval churches. Cruciform St Michael from the south. 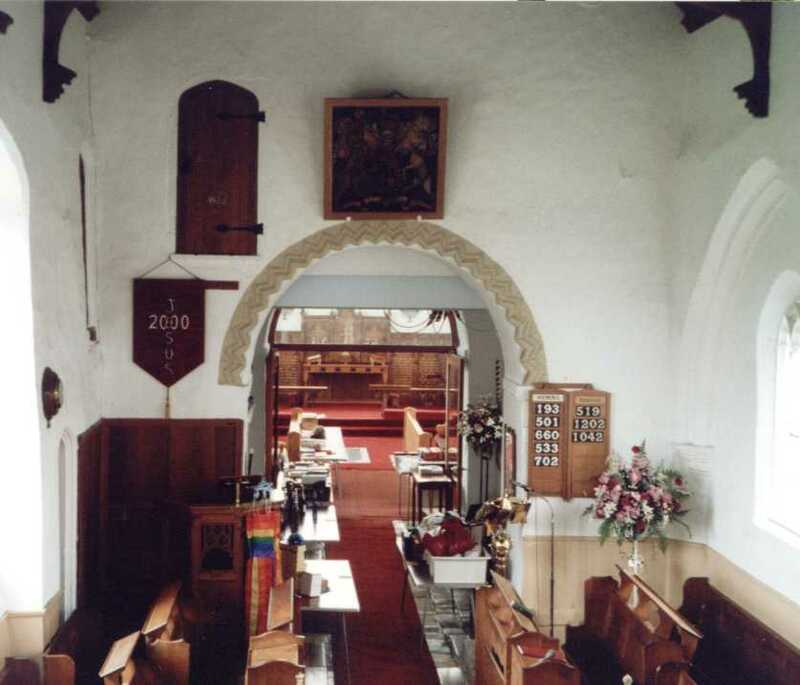 Note that the chancel to the right is higher than the nave to the left. 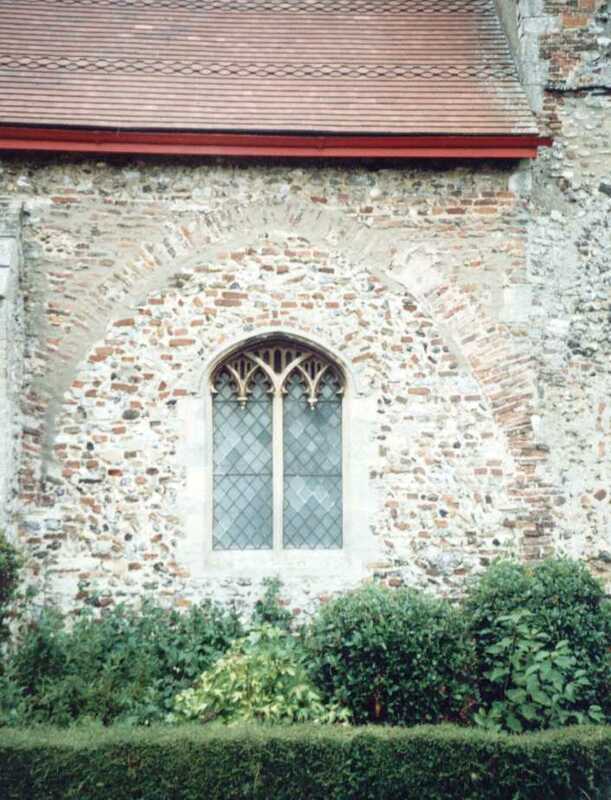 St Michael was once a cruciform church with a central tower, an uncommon pattern in Suffolk, and one not recorded too many times on this site. Eyke, Dallinghoo, Pakenham and Ousden spring to mind, and possibly Brockley. The transepts have gone, and the tower is a replacement of the 18th century and later. Walking around the outside, though, there are a couple of points of interest. Surviving in the south wall is the outline of an arch. In the days when this was a Catholic church, it probably led into the chantry chapel of the guild of the Holy Trinity, and was obviously left disused, and filled in, after the Reformation. 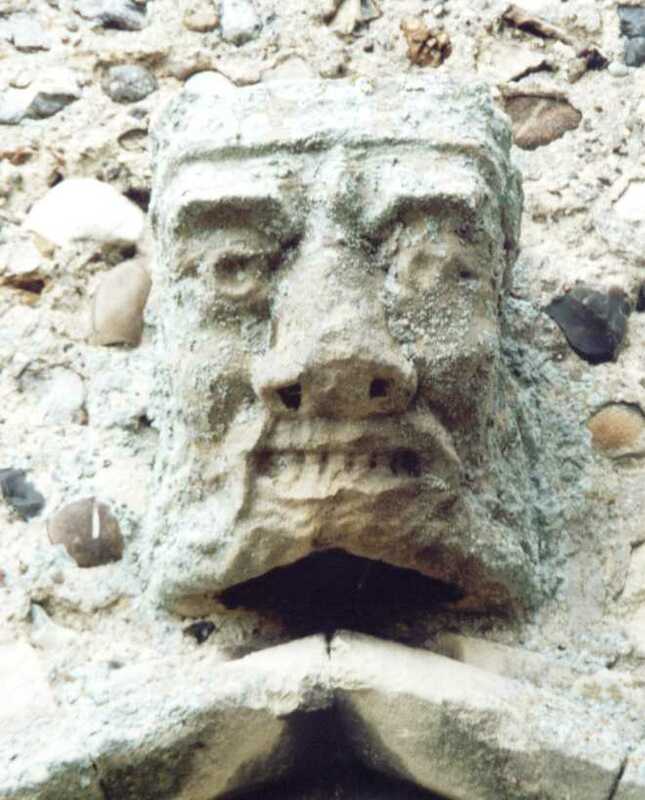 The 14th century priest's doorway has a fine, fierce grotesque corbel above it, with flaring nostrils. It's probably not in its original place. The south porch is nice on the outside, but rather grimly repainted on the inside. 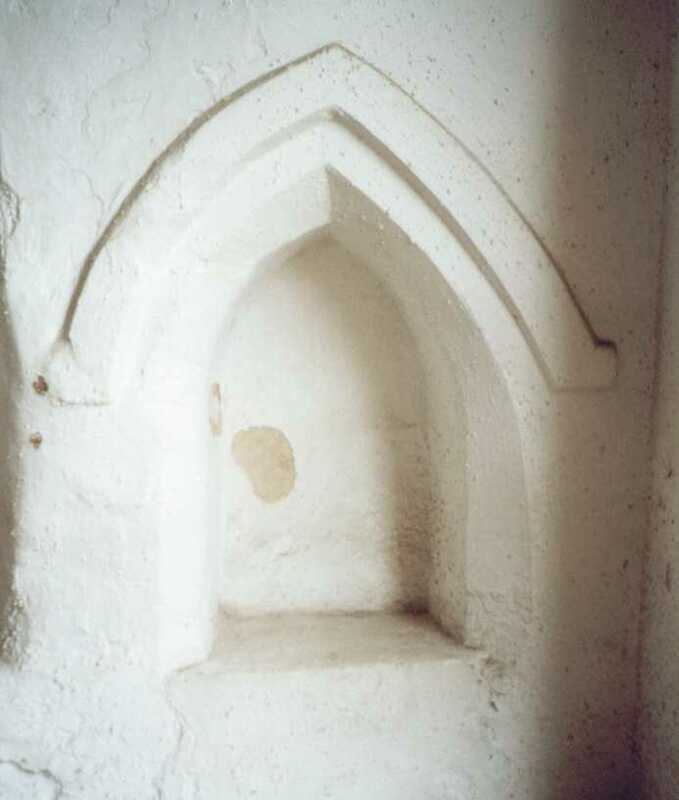 There are two curious alcoves in the inside east wall, the left hand one of which was probably for a holy water stoup - but again, they may not be in their original places. The Norman doorway is not one of Suffolk's finest. The outline of the archway that led into the pre-Reformation chapel of the Holy Trinity. Above: the right hand alcove in the porch. It looks more like a piscina or image niche than a stoup, and was probably moved here from elsewhere. Left: Grotesque above the priest's door. The key (of which more in a moment) lets us into the priest's door, and, as always in churches with central towers, one is struck by the extent to which the chancel is cut off from the nave. It is also higher than the nave. 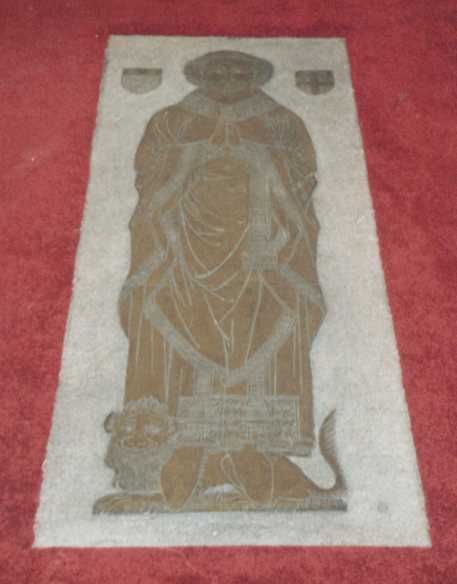 Replica of the brass of Adam Bacon, set in the rather alarming chancel carpet. Also striking is the lurid chancel carpet - not quite competition for the one at Tuddenham St Martin, but alarming just the same. The results of the 1857 restoration are plain to see, and one of them was the theft at that time of the two fine brasses in the chancel floor, which were no doubt melted down soon after. However, Henry Davy had taken copies of them, and replicas made from these lie in their place. The single man is Adam Bacon, who was a priest here. Dating from 1318, it was the earliest English brass to depict a priest wearing Mass vestments, and its loss is a grievous one. No less interesting are the couple in the other brass. The man is none other than Sir John Fastolfe, immortalised by Shakespeare as Sir John Falstaff. I understand that he was rather less jolly in real life. He lies with Katharine, his wife. Stepping beneath the tower, we look up at two interesting things. Firstly, the door high up in the east nave wall. This is to the tower stairs, and shows that access to the tower was via the rood loft. Secondly, a rare coat of arms of James II, which apparently came from a London church, although there seems to be some disagreement about exactly which one. The gallery at the west end is rather fine, and still bears a dedicatory inscription: Erected at the expense of the patron of this Rectory and some of the principal landowners and inhabitants 1836. There is a good view of the church below from it. 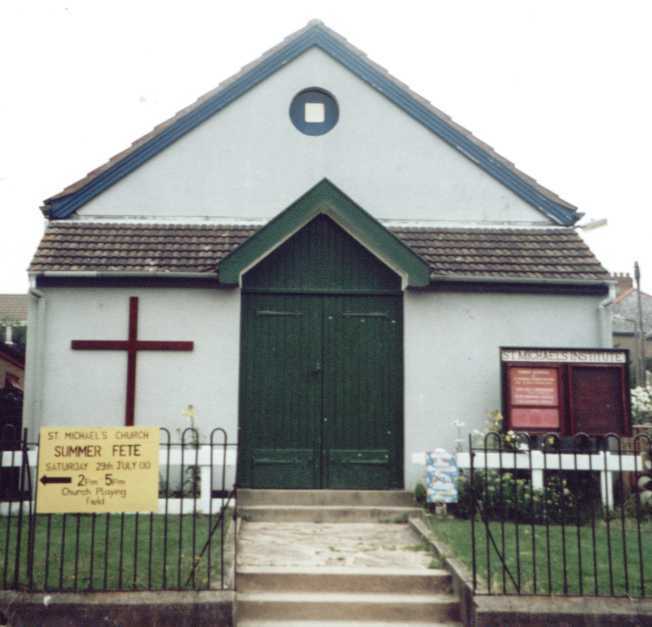 On my visit, the church was packed with trestle tables and jumble for the following day's summer fete, which was at least a sign of a bit of life in the parish. I was not surprised to find the church locked (all Lowestoft churches are kept locked) but I was surprised to find a keyholder listed. I hastened to collect it, but was treated with much suspicion, being questioned as to my motives, having to prove my identity and offer up my cheque guarantee card (which was copied) to obtain the key. As the keyholder was the Rector, this made me rather sad. Your guide appears somewhat derogatory and biased. As someone who frequently visits churches, you should know they are generally locked. Now, this simply isn't true. 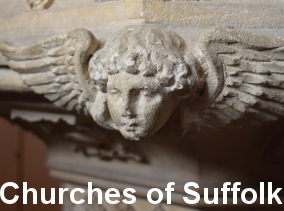 Most Suffolk parish churches, indeed most English parish churches, are kept open. However, the e-mail continued: St Michael's is locked because of its isolated position, and because the insurers will not insure it open and unattended and being a small congregation do not have the personnel to be there. I thought this was also sad. Even so, it struck me as strange that Evangelists for Christ's Word on Earth should be more concerned about protecting their property than being open as an act of witness. I read on: Surely a phone call to the incumbent - and you know where bonafide enquirers may obtain the numbers - would be the best way of introducing yourself, and to make sure that the church could be conveniently opened. At St Michael's this would have avoided your photograph in bad taste of the church interior as the Summer Fete was being prepared. St Michael's Institute, half a mile away in the old village. A relic of the commitment of the 19th century church to education and parish welfare, and still in use today. It might also have meant that more interesting information about St Michael, Oulton could have been given to you, and a guide produced without the need to include comments which appear to have been made as a result of an ill-planned visit and subsequent unpleasant meeting with a key holder, who happened to be the Rector. All St Michael's key holders are expected to get identification from anybody asking for a key to the church, and not known to them personally, especially when the request is from someone not dressed as would be normally expected for their purpose in the area. While St Michael, Oulton is in the care of the present generation, it is intended that all will be done to preserve it for the future. Well, as you can imagine, this made me breathe out in exasperation. What, then, is the point in being a Church? Most people who turn to God do not do so by turning up for a church service. Most wander into an empty church, perhaps more than once, and respond to its prayerful silence over a period of time, before taking the plunge and joining the community for worship. This would not be possible in Oulton, or almost anywhere in Lowestoft. Someone seeking salvation in Lowestoft would be hard-pressed to do so in a Christian building. There is only one Lowestoft church that opens its doors to strangers (thank God there is one!) and that is Our Lady Star of the Sea, the Catholic church in the town centre. But I think that our churches are there for the whole People of God, not just for the Sunday club of believers. When the Victorians tried to resacramentalise the parish churches of England, they were very fond of a quotation from the Book of Genesis: This is the House of God, and this is the Gate of Heaven. They inscribed this above the entrance to many of Suffolk's churches. An open church is the greatest act of witness a parish can make. By simply locking our churches, insuring them, and 'preserving' them for the future, we may find that we end up with no future for which to preserve them. Is it possible that, by keeping our church doors locked, we are barring the Gate of Heaven against the People of God? Oh, and I'm still trying to work out exactly what someone not dressed as would be normally expected for their purpose in the area means. Does it mean me? Oh dear. My advice to anyone seeking salvation in the west Lowestoft area is to smarten up a bit, and phone ahead. Otherwise, maybe God won't get to hear about it. St Michael, Oulton, Lowestoft, is at the end of Church Lane, off of Hall Road, which is off of Gorleston Road just north of Mutford Bridge. It is kept locked, and there is a keyholder (but be prepared to be disapproved of).